At the core of the group are Aubrey Atwater and her husband Elwood Donnelly. For decades they have performed traditional music in New England. 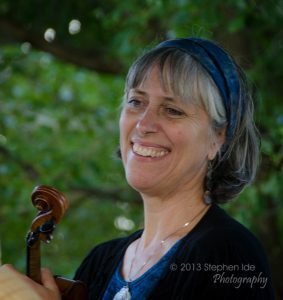 Rounding out the trio is fiddler and cellist Cathy Clasper-Torch, who adds just the right flourishes and harmonies to fill out the group’s sound. The Atwater-Donnelly Trio performs on Mansfield’s South Common in the kick-off event for the Rose Garden Coffeehouse’s 2013-2014 season on Saturday, Sept. 21, 2013. The free show was presented after the Mansfield Music & Arts Festival. The Atwater-Donnelly Trio consists of Aubrey Atwater (banjo, guitar, dulcimer, dance), Elwood Donnelly (guitar, harmonica, dulcimer, limberjacks, bodhran) and Cathy Clasper-Torch (fiddle).Photo by Stephen Ide. There’s something about Atwater-Donnelly that is incredibly endearing. I love hearing them play some fast-paced traditional number, or sweetly affecting harmony song, then watch Aubrey start clogging. Elwood breaks out his limberjacks and Cathy takes off with some wonderful fiddling. They are a favorite groups at the Rose Garden, returning every few years or so. They are funny, spontaneous and supremely talented. People are amazed at all the instruments they play and how they seem to be having as much fun as the audience. The Atwater-Donnelly Trio performs on Mansfield’s South Common in the kick-off event for the Rose Garden Coffeehouse’s 2013-2014 season on Saturday, Sept. 21, 2013. The free show was presented after the Mansfield Music & Arts Festival. Photo by Stephen Ide. 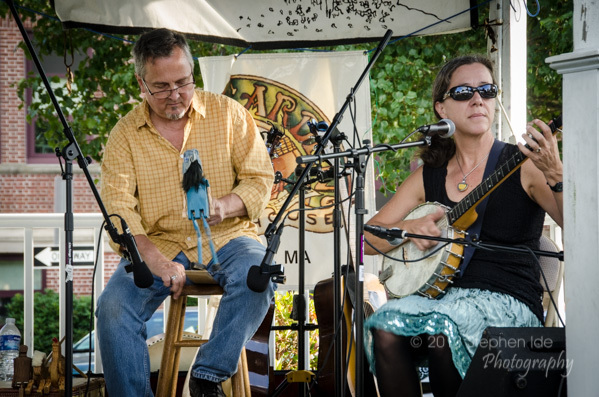 The group plays a wide range of instruments, from guitar and fiddle to Appalachian mountain dulcimer, cello, mandolin, tin whistle, harmonica, banjo, bones, spoons and limberjacks (dancing puppets). Atwater also is an onstage powder keg, as she demonstrates Appalachian clog dancing and French Canadian footwork. 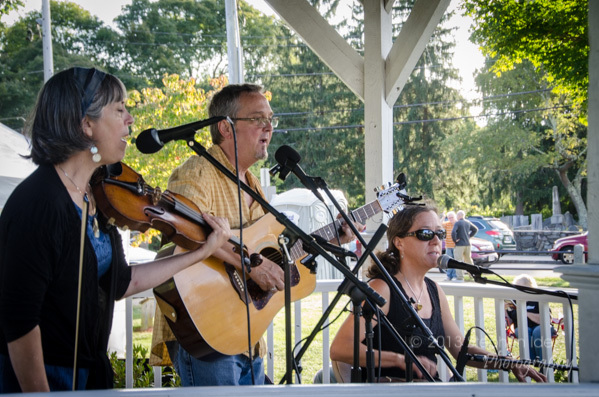 The last time the trio performed at the Rose Garden, in 2013, they were outside, in the pavilion on Mansfield’s South Common. But the Nov. 18 show will be inside, at the Rose Garden’s traditional venue in the Congregational Church, an intimate setting ideally suited to this talented trio. Cathy Clasper-Torch (fiddle).Photo by Stephen Ide. People can expect the unexpected. The Rose Garden Coffeehouse, is a 501(c)(3) not-for-profit organization in its 29th season of continuous operation. The event will start at 8 p.m. in the Congregational Church, 17 West St., Mansfield, Massachusetts. The doors open at 7:30. It’s wheelchair-accessible and alcohol-free. Tickets can be purchased online at www.rosegardenfolk.com for $16, and for $20 at door. The Rose Garden’s all-volunteer staff serves home-baked dessert items and hot and cold drinks of the season before the show and during intermission.